Archive for the ‘“Practice makes better!”’ Category. 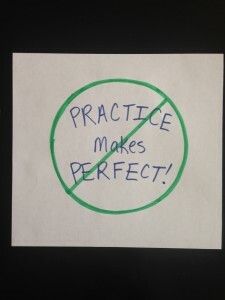 As I am ever battling perfectionism, I was almost giddy when I heard my wise friend, Laura Zych, use a much improved version of “Practice makes perfect!” It makes SO much more sense to say, “Practice makes better!” She has no idea where she first heard it and it makes me wonder why it’s not more common of a saying. Let’s start a new trend, folks! Let’s banish the notion of “perfect” and embrace “better” as the greater thing! For more on the topic of Perfection, refer to your copy of Parenting with Scripture: A Topical Guide for Teachable Moments.